I planted 6 bare root grape vines today. It felt like an important moment. Deciding just where to put them, digging the holes and filling them with organic mulch. Seeing grapevines creates a strong connection to memories of home for me. When I was really little, I played hide and seek with my sisters in the vineyard across the street from our house in Livermore, California in the 1970’s. I’d crawl underneath huge vines that were loaded with grapes. I remember eating them straight from the vine – the dark purple fruit was hot from the September sun and tasted like sweet jam. They must have been red wine grapes, because they had thick skins, seeds and were as sweet as little sugar cubes. What is it about seeing a vineyard that feeds our soul? Could it be the collective memory of 8000 years cultivating them? Vineyards have inspired painters, poets and lovers with their neatly organized rows and ripening fruit on the vine holding the promise of wine and romance. Grape vines and wine have been the central focus of many religious traditions, good food and family gatherings. No wonder we marvel at the sight of a vineyard. Grapes reveal the secrets of the sun and soil. The vineyard is full of promise. I hope you have a place where you can plant grape vines!! Princess, Flame & Thompson Seedless planted along the horse hitches. You can see the white identification tabs. Two Black Manukka on each side of fence. There are three different types of grapes (Genus: Vitis): American (V. labrusca), European (V. viniferia), and North American native Muscadine (V. rotundifolia). American grapes are the most cold-hardy, while European grapes, usually more for wine than the table, do well in warm, dry, Mediterranean type zones. Hybrids are available. Thick skinned Muscadines thrive in the South. • Plant dormant, bare-root grape vines in the early spring. • Construct a trellis or arbor before planting. Grape vines will need to be trained to some sort of support to grow upward. This will also cut the risk of disease. • Most grape varieties are self-fertile. To be sure, ask when you are buying vines if you will need more than one plant to for pollination. • Before planting grapevines, soak their roots in water for two or three hours. • Select a site with full sun. If you don’t have a spot with full sun, make sure it at least gets morning sun. A small amount of afternoon shade won’t hurt. Your soil needs to be deep, well-drained, and loose. You also need good air circulation. • Space vines 6 to 10 feet apart (16 feet for muscadines). • For each vine, dig a planting hole 12 inches deep and 12 inches wide. Fill with 4 inches of topsoil. Trim off broken roots and set the vine into the hole slightly deeper than it grew in the nursery. Cover the roots with 6 inches of soil and tamp down. Fill with the remaining soil, but don’t tamp this down. • Prune the top back to two or three buds at planting time. • Water at time of planting. Make sure you purchase grape vines from a reputable nursery. Vigorous, 1-year-old plants are best. Smaller, sometimes weaker, 1-year-old plants are often held over by the nursery to grow another year and are then sold as 2-year-old stock. Obtain certified virus-free stock when possible. • Don’t be afraid to remove at least 90 percent of the previous season’s growth. This will ensure a higher quality product. Remember, the more you prune, the more grapes you will have. • In the first year, cut back all buds except for 2 or 3. Then, select a couple of strong canes and cut back the rest. Make sure the remaining canes are fastened to the support. • In the second year, prune back all canes. Leave a couple of buds on each of the arms. Remove flower clusters as they form. • Do not fertilize in the first year unless you have problem soil. Fertilize lightly in the second year of growth. • Use mulch to keep an even amount of moisture around the vines. • A mesh net is useful in keeping birds away from budding fruit. 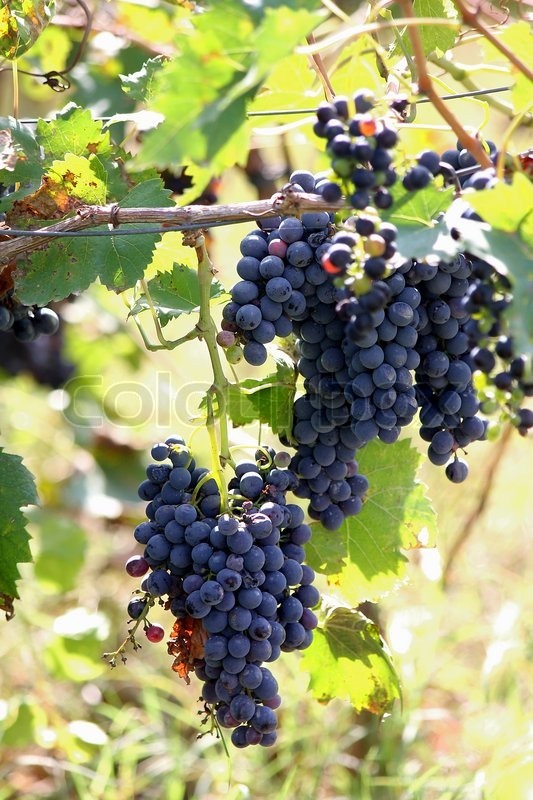 • If grapes aren’t ripening, pinch-back some of the foliage to let in more sunlight. • Grapes will not continue ripening once picked from the vine. Test a few to see if they are too your liking before harvesting, usually in late summer-early fall. • Grapes can be stored for up to six weeks in the cellar, but grapes can absorb the odors of other fruits and vegetables, so keep them separate. Use cardboard boxes or crates lined with clean, dry straw. Separate bunches with straw or sawdust. Check often for spoilage. Hey Sis – i remember when we used to play hide and seek too. That was great fun!! I was always disappointed when someone found me too soon….didn’t get to eat enough grapes. I remember picking some and trying to make wine in the bath tub at home – were we in trouble. Did you know those vineyards belonged to the famous Wente Winery in Livermore, CA? We were eating some pretty high end grapes for snacks. That explains that little something special.